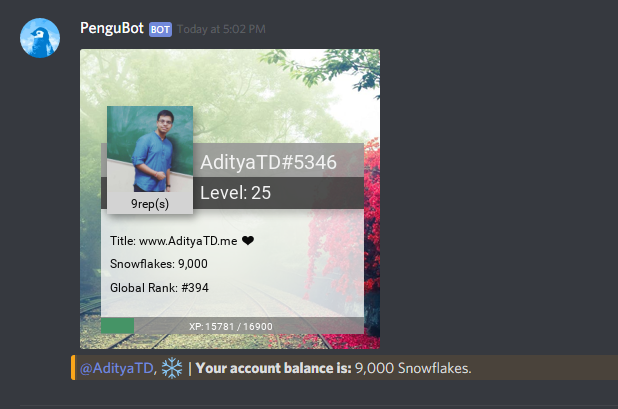 Multi-Purpose Discord Bot with Powerful Music, Social Profiles, Economy, Moderation, Fun, Utility and Much More! 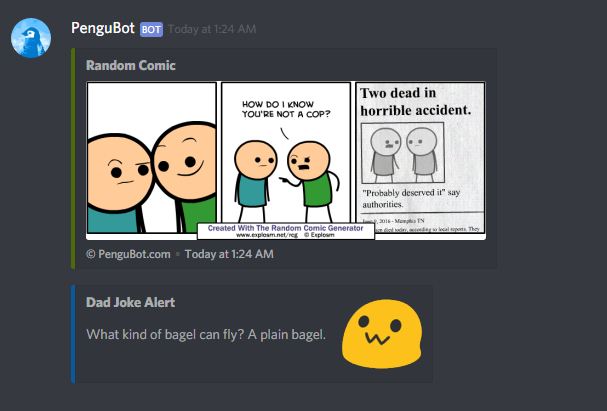 Pengu really knows how to make you laugh with its amazing Dad Jokes! It even has comics, bet you didn't see that one coming Marvel! Punching, Hugging, Slapping, etc. hasn't ever been this easier before! 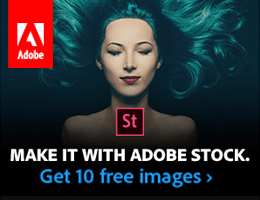 Generate over dozens of Custom Images with Pengu because Custom Things are for The Cool Kids like You! Enable/Disable Commands or Command Groups on the go! Add Moderators, Admins or Pengu DJs to make it easier for you to manage! Toggle anything to everything you want or don't want with just one command! Change Welcome, Leave and Other Messages easily! 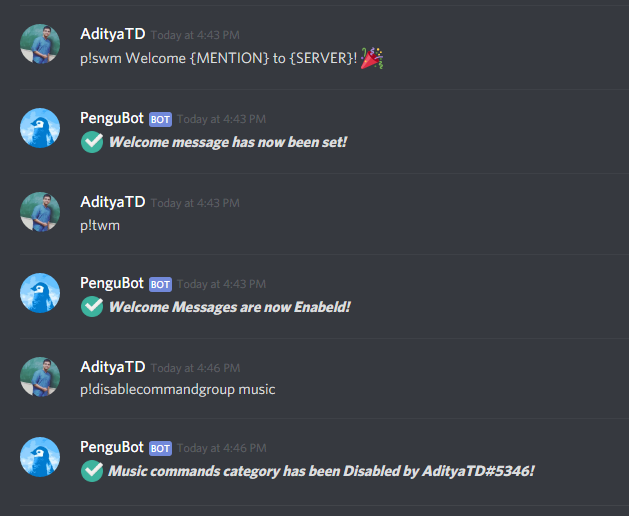 Coming Soon: Change the language which PenguBot responds to with just a single command into multiple languages to choose from! Experience, Levels, Reputation and Snowflakes, who will get to the top? Level Up by being more active in the servers you love! Grow your Reputation points by being positive and responsible! Earn more Snowflakes to Customize your Profile Backgrounds, play games like Slots and much more! User Friendly Searching from YouTube or SoundCloud! Music Nodes in 3+ Continents for Lag Free and Quality Music Experience! Exporting and Loading of Server Queue! 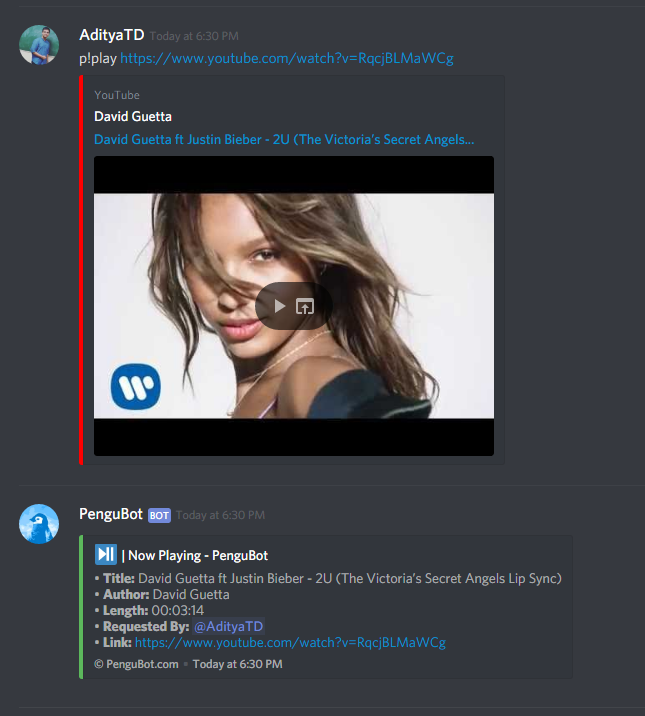 PenguDJ Mode to give only DJs the exclusive access to Music Commands! Spotify, YouTube, Twitch, SoundCloud Dailymotion, Vimeo, HTTP (MP3, M3U, etc.) and Many Other Platforms Supported!